We pride ourselves on letting you know about the top mobile slot games and casinos. But that doesn't always make it easy to find what you want when you want it. At last count we have a ridiculous amount of mobile slot reviews. We try and make it as easy as we can to let you know the mobile slot games we think you should be playing, enjoying and generally loving. Lucky even leaves his paw prints all over our them so you can see which ones are our favourites. Alternatively you can have a look at our top Android slots and casinos or iPhone and iPad slots and casinos if you were trying to be more specific. But sometimes, and we’ve been there, you don’t really want to think. You just want to be inspired and generally told what to play next without having to find slot games for yourself. Especially when there is now so much choice, with new mobile slots coming out every month. So for when you are feeling lazy, here is our current top fives of… everything. By far the most difficult list to create due to the huge amount of slots available to play on mobile, we’ve done our best, but this is very much down to personal taste. 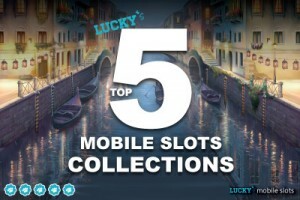 Personally, for every mobile video slot we put on the list, we wanted to add ten more. So to narrow it down to only the 5 best slots for real money play, we asked ourselves two questions: how closely does this casino game feel and play like the original online slot machine? And do they work as an Android slot, iPhone slot and iPad slot? Royal Masquerade Slot: This Play’n GO slot game takes you back to Venetian times where masked balls were all the rage. Plus this high variance slot offers you a 0.10 minimum bet plus the chance to win 10,000x your total bet. Starburst Slot: Bright, beautiful and with wilds that won’t stop giving, it’s the master of NetEnt slots. Thunderstruck II Slot: Expanded wilds! Free spins! Unlock-able achievements! Jackpot wins! By Thor, Odin and Loki, this Microgaming Thunderstruck II slot is beautiful and gets us excited every time we play! The Incredible Hulk Slot: Smash your way to some incredible bonus rounds with the very angry (but surprisingly generous and graphically brilliant) green giant in this licensed slot from Playtech. Justice League Slot: Another fully licensed game makes it in to the top 5 slots list with the whole DC Comics super hero crew, from Superman, to Batman, Wonder Woman, The Flash and others providing some surprising wins on this five reel game. Classic mobile slots are fewer in numbers, but the worthwhile ones you have to hunt down. Except right now when you can simply go read the ones we think you’ll find most worthwhile. Again, they all have to be mobile slot machines that you can play on your Android, iPhone and iPad casinos. It’s all or nothing. Jackpot Jester Wild Nudge: A classic casino game with a twist NextGen’s Jackpot Jester Wild Nudge slot comes with a max win of 200,000 plus a medium to high variance to give patient slots players bigger wins. Break da Bank: Come rain or shine, nothing will break this classic slot from your gameplay. Fun and reliable classic spins. 5x Magic: The dark horse of the race, 5x Magic impressed us. It also has a few very interesting tricks up it’s sleeve. Gold Rally: Not for the faint of heart, this £/$/€18 min bet mobile jackpot slot favours the bold. Couch Potato: As classic as slot entertainment gets, one payline with Seven’s & Bars and a sweet in-game Jackpot. We are easily finding more and more mobile jackpots on mobile. Online casinos are waking up to the fact that it shouldn’t matter where you win the jackpot, it’s just as exciting if you run and shout like a maniac on a train platform as when at home. More embarrassing, but just as exciting. Mega Fortune: The Guiness World Record holding jackpot slot for the biggest slot jackpot ever won on mobile. With the jackpot rarely hitting below 4 million, this exciting slot creates more millionaires than any other out there. Mega Moolah: Having the honour of being the slot with the largest mobile progressive jackpot ever won (£3.7 million), this is easily a favourite of ours. Mega Fortune Dreams: One of the most popular jackpot slots that pays out on a consistent basis and has provided lots of winners over at Casumo mobile casino. Major Millions: Another Microgaming video slot, it joins Mega Moolah mobile slot as one worth watching when it starts getting into quadruple digits. Empire Fortune: Yggdrasil gaming get in on the jackpot slots action with this 5 reel, 20 payline slot that offers free spins and the chance to win thousands. What top five slots list would be complete without a little hint of where we think you’ll be able to play all these wonderful and brilliant casino slots? So here is the list of where we play most often and our very favourite and best mobile casinos. Leo Vegas: The most games, the best mobile experience and a great promotions makes Leo Vegas mobile casino our top choice. Vera & John: Second to Leo Vegas in terms of games, their loyalty program, daily slot tournaments and customer service is above and beyond. Guts Casino: Fun, funky new kid on the block, they are aggressive with their casino bonuses and provide as big a range of mobile slots as Vera & John casino, plus no wagering on their free spins bonuses. Mr Green: Beautiful, simple and thrilling, Mr Green mobile casino knows how to pick the best mobile slots of the pack and give them to you on a silver platter. Casumo: Play the complete Play’n GO slots collection like Royal Masquerade, along with top jackpot slots including Mega Fortune Dreams. So there you have it. Our top five of everything. If you think we’ve made a huge mistake or have a top five list of your own, then share it with us! We love a good slot debate.